This volume, The Lost Sermons of C.H. 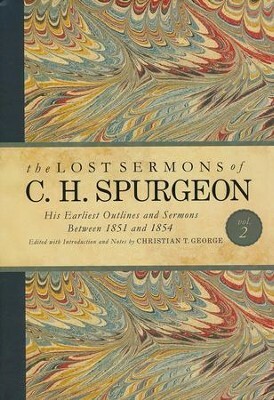 Spurgeon, Volume II: His Earliest Outlines and Sermons between 1851 and 1854 contains an introduction, fifty-seven sermons he preached itinerantly and as pastor of Waterbeach Chapel, and an analysis of these sermons by editor and Spurgeon scholar Christian T. George. This multi-volume set includes full-color facsimiles of Spurgeon's original handwriting, transcriptions of his outlines and sermons, biographical introductions, and editorial commentary that further illuminate Spurgeon's work. Written for scholars, pastors, and students alike, The Lost Sermons of C.H. 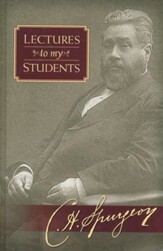 Spurgeon will add approximately 10 percent more material to Spurgeon's body of literature. 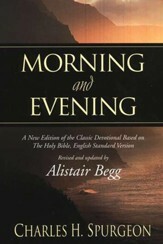 Charles Spurgeon; Alistair Begg, ed. In 1857, Charles Spurgeonthe most popular preacher in the Victorian worldpromised his readers that he would publish his earliest sermons. For almost 160 years, these sermons have been lost to history. In 2017, B&H Academic began releasing a multi-volume set that includes full-color facsimiles, transcriptions, contextual and biographical introductions, and editorial annotations. Written for scholars, pastors, and students alike, The Lost Sermons of C. H. Spurgeon will add approximately 10 percent more material to Spurgeon's body of literature. 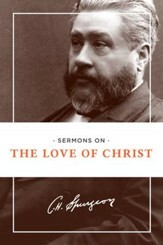 "Happy are those who love the biblical wisdom proclaimed by C. H. Spurgeon. . . to receive more of this wisdom in these volumes! 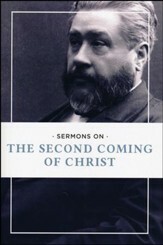 The providence of God wonderfully preserved these early sermons by Spurgeon and the Lord has graciously delivered them into the hands of Christian George to arrange their publication. They will serve to extend the far-reaching, undying influence of the blessed ministry of Spurgeon. "German theologian-preacher Helmut Thielicke once advised, Sell all that you have and buy Spurgeon. As the scroll of the Word of the Lord was found in the temple during the reign of King Josiah, so theologian-preacher Christian T. George has both found the lost sermons of the preeminent preacher, Charles Haddon Spurgeon, and is representing Spurgeon's lost sermons . . . . which will forge a revival for preaching the whole counsel of God in this present and future generation of pastors, scholars and students to the glory of God." "A towering achievement. These volumes represent a massive contribution to the Church and will serve to preserve the invaluable legacy of Charles Spurgeon for another century more. What Christian George has curated here is nothing short of monumental." I'm the author/artist and I want to review The Lost Sermons of C. H. Spurgeon, Volume II: His Earliest Outlines and Sermons between 1851 and 1854.